If I could choose how I die, I would definitely choose death by alfajores. Yep, death by a sugary, butter-induced coma doesn’t sound to shabby to me. Did I mention that these cookies are sandwiched together with dulce de leche? That’s right, caramel sauce! 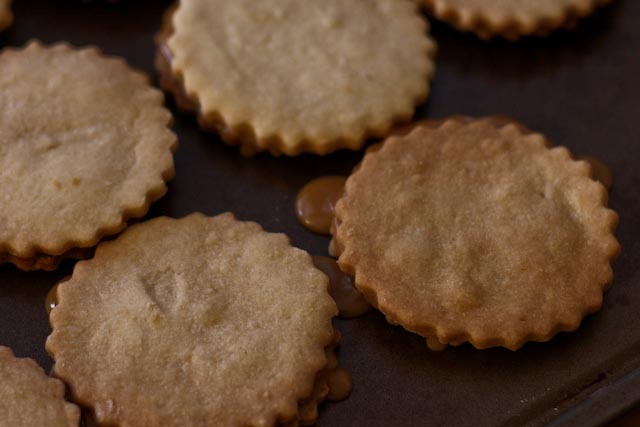 You can buy dulce de leche at most grocery stores (Whole Foods has it), but you can also make it easily yourself. All you need is a can of sweetened condense milk and a few spare hours just to keep an eye on it while it cooks. 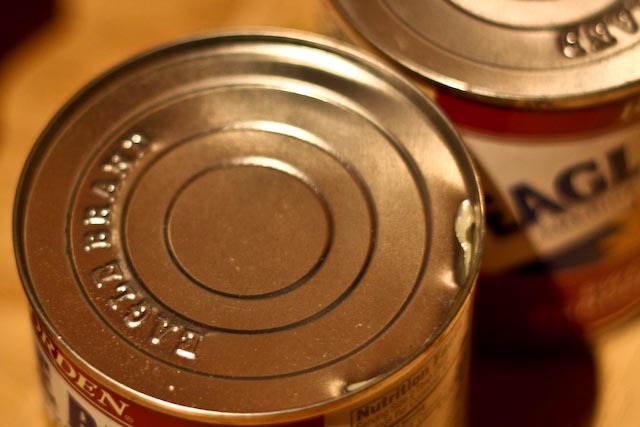 You MUST pierce the seal of the can (either with a can opener or pulling back on a pull-tab top ever so slightly. This is VERY important! 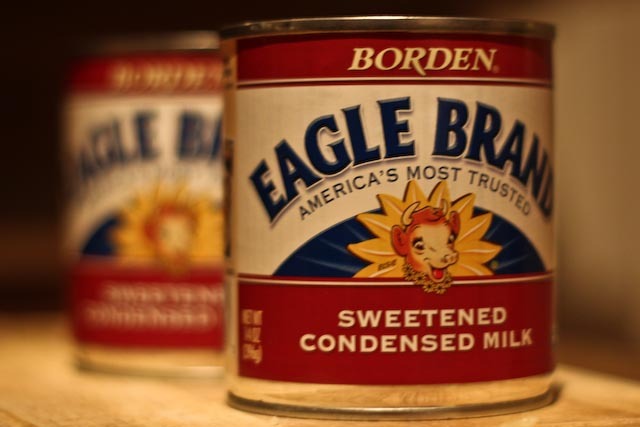 If the can is sealed, the air inside will have nowhere to go as it heats and you may end up with a sweetened condensed explosion in your kitchen. Pierce the seal. Trust me. The cans simmer in a water bath that covers about 3/4 of the cans. As the milk simmers over time, water will evaporate, so you have to add a little water every half hour or so. This keeps the milk from burning. 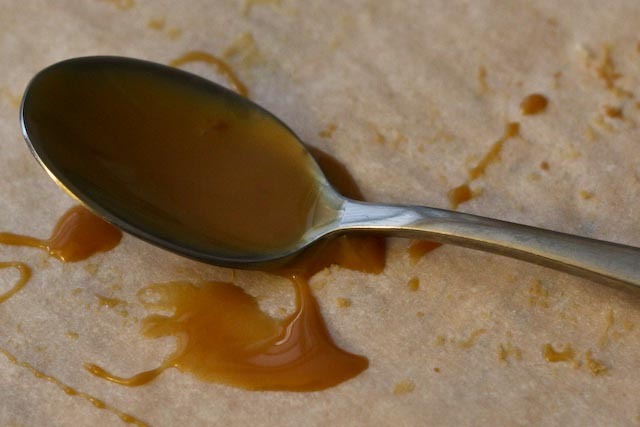 About 3 1/2 hours later, you end up with a gooey, thick caramel sauce. Let the cans cool before you try to open them (don’t burn your fingers!). You can cook the milk up to 4 hours (the longer you cook it, the darker the caramel should be. 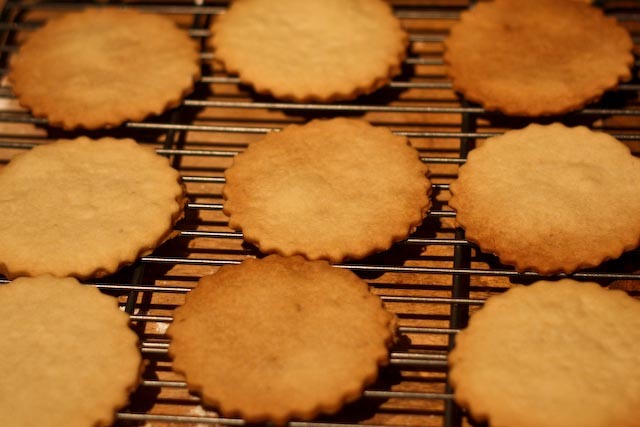 Alfajores are made with a simple shortbread dough. A helpful trick for these cookies is letting the dough get nice and cold in your fridge (or freezer – although you don’t want it to freeze completely!) before rolling it out and using cookie cutters. I used a vintage cookie cutter that I bought in an antique store, but you could really use any round or other fun shape for cutting these cookies (stars would be fun for Christmas time!). Just look at that caramel goodness. 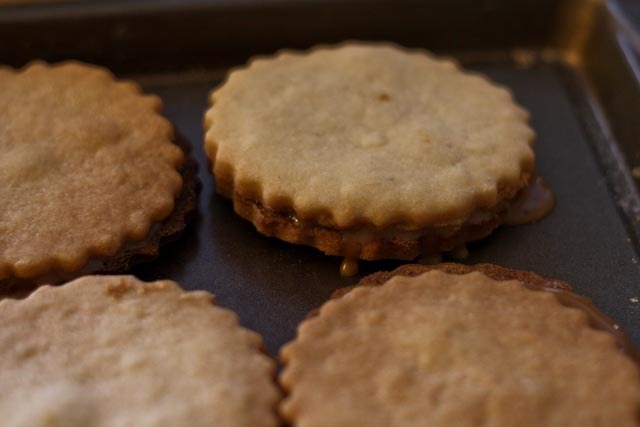 Two cookies are sandwiched together with oh-so-delicious dulce de leche. Yum! 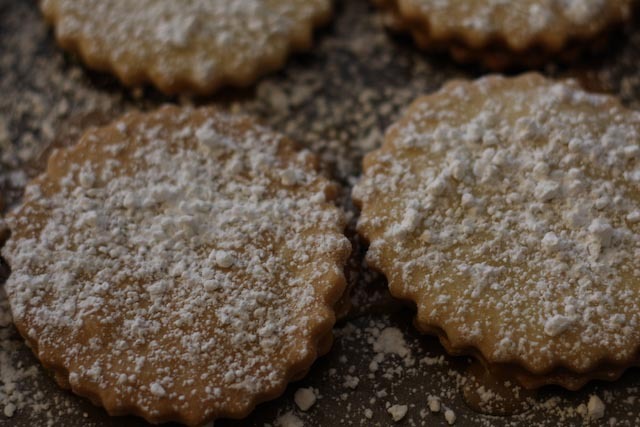 A final dusting of powdered sugar makes these little gems complete. Enjoy! Preheat oven to 350°F. In a large bowl using an electric mixer, combine flour, sugar, salt and butter, mixing well until dough comes together into a ball. 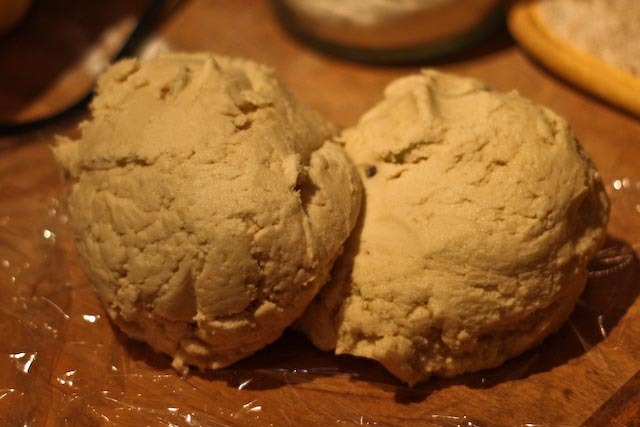 If the dough is too sticky, add a bit more flour so that you can shape the soft dough into a ball. Wrap the dough ball in plastic wrap and refrigerate for about 30 minutes. Sprinkle some flour onto your work surface and roll the dough to approximately 1/8 inch thick. 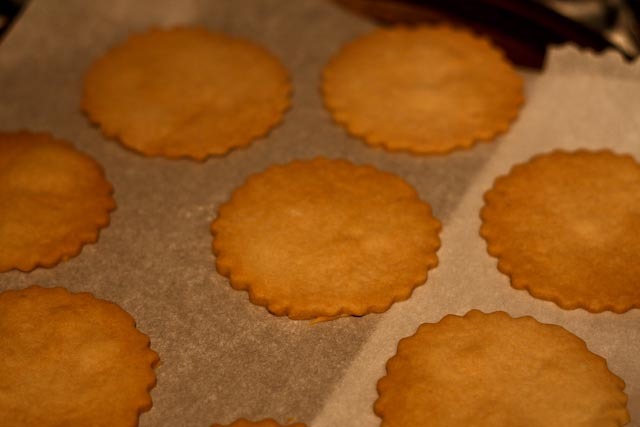 Using a round (approximately 2 inches in diameter) cookie cutter, cut out the cookies and transfer to a parchment lined baking sheet. Continue re-rolling scraps and cutting out shapes. Bake cookies for about 15-20 minutes, or until they are golden and firm. Remove from the oven and let cool for about 5 minutes before transferring to a wire rack. 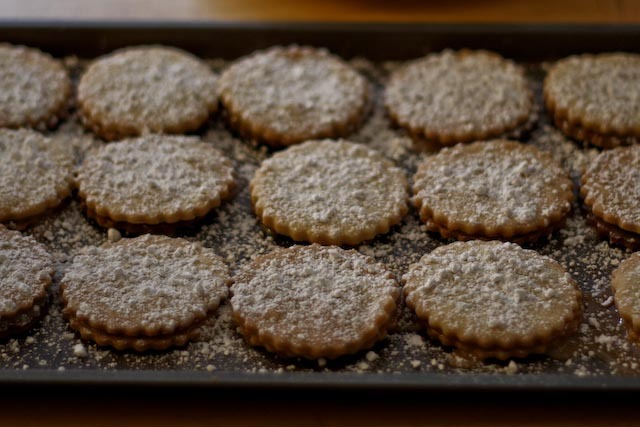 Let cookies cool completely (about 25 minutes). 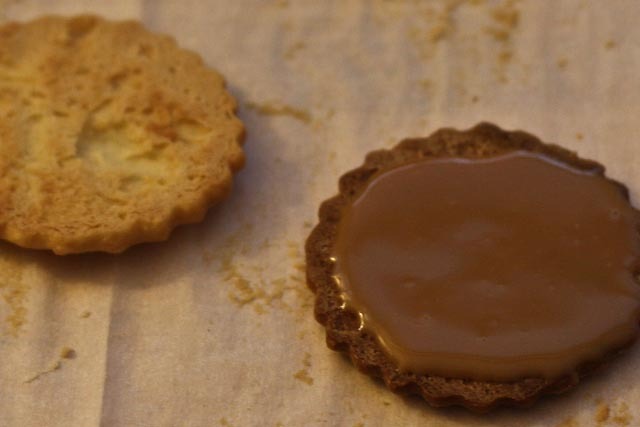 Carefully, and using a small spoon or knife, spread about 1 tbsp of dulce de leche on the underside of a cookie and sandwich with another cookie, putting the cookies back to back so the golden top of the cookie faces out. Repeat with the remaining cookies. 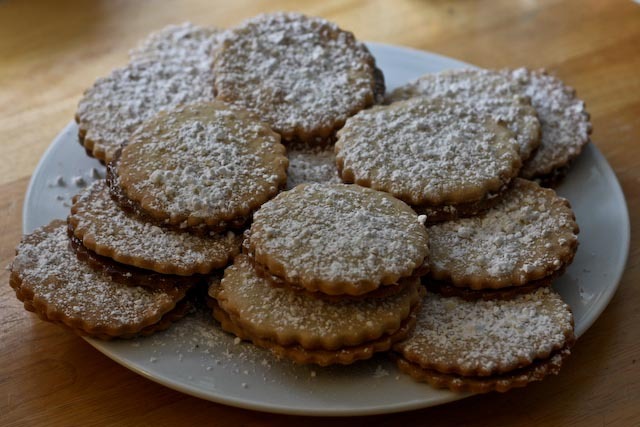 Using a small sieve, dust the cookie sandwiches with powdered sugar and serve. 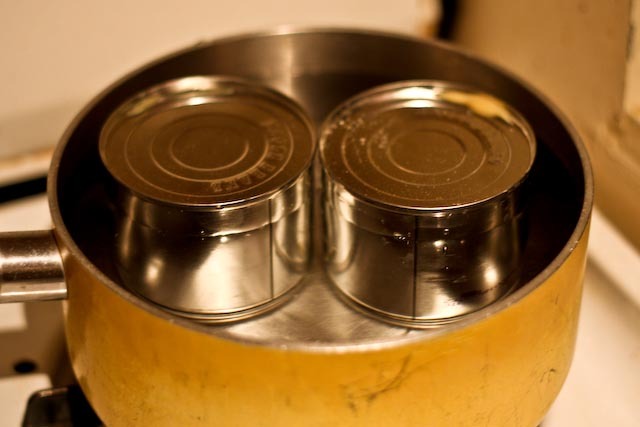 Remove the label from the cans and pierce the seal of the can (you will want to make a slight opening so hot air can escape – you can do this with a can opener, or, if the can has a pull tab, break the seal by pulling back slightly on the tab without opening the can all the way). Place the cans in a medium sauce pot and fill the pot with water about 3/4 of the way up the cans. Bring the water to a low simmer and continue to simmer for about 3 1/2 hours. Add water to the pot every half hour or so to replenish the water level as it evaporates. Remove from heat and allow the cans to cool before opening. 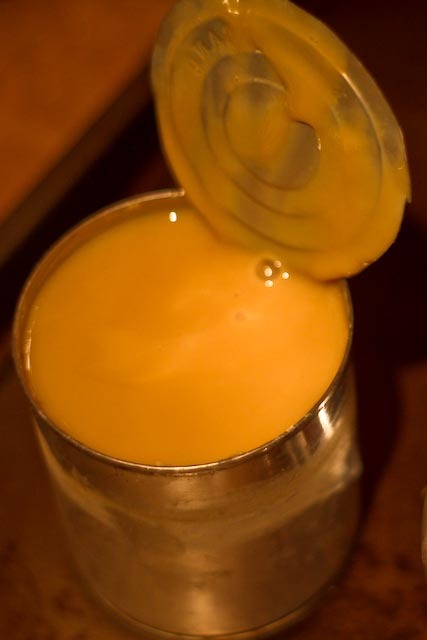 Store the dulce de leche in a sealed container and refrigerate. It will keep in the fridge for several months. Your alfajores look soo delicious. Yum Yum! I’ve been seeing so many dulce de leche based reipes lately and I really want to give it a go. I was thinking of doing the method where the cans are fully submerged under water (and you make sure it remains that way throughout the process), have you ever tried it that way? I’ve never tried making dulce de leche with the cans completely submerged. If others have tried it – with no explosions! – then definitely give it a try. One thing I wanted to be sure to do was to break the seal of the cans in order to let some air escape to avoid a kitchen catastrophe (and if you break the seal of the cans, you probably wouldn’t want to submerge them totally). Good luck and happy new year to you as well!